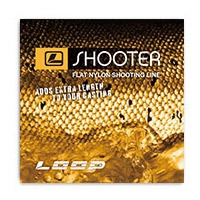 Flat nylon shootingline. Sink rate: Intermediate. 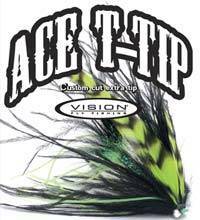 If you need to get down deep, use large and heavy flies and still want to maintain your control, Ace Skagit floating head + T tip is the line system for you. 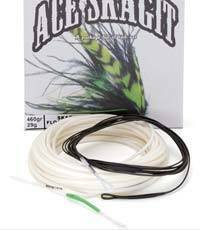 This floating head range covers line weights for relevant rod lengths and weights. A floating head is without any question the number one choice for Skagit fishing. It is ridiculously easy to use and it will get the job done in most of the cases. In some places, however, the surface flow is so strong or complex that it will make the sinking of the fly to the killing zone very difficult or the floating head drags the fly too fast when you want to present it slowly. To solve these problems, you need to get the large diameter head under the surface and away from the strongest current layer. Unlike some of our distinguished colleagues in the industry, we feel that leaving a part of the head on the surface is not the right way to proceed and thus our head is fully intermediate. At the beginning of Vision's Skagit era, they introduced the traditional level T-tips to be used with the floating head. Although very generic in nature, this package doesnt cover all possible situations. Anglers were using from the start their existing tips to cope with each situation at hand. 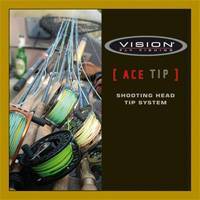 These tips were designed to be used with normal Ace shooting heads and were not optimal for extra short and heavy Skagit heads. In order to complete Vision's Skagit range, they designed a set of optimized tapered tips including obligatory Floating, Intermediate and Sink3 tips. When combined with a Floating or an Intermediate Skagit head, the angler can basically cover all the layers from the surface down to the depth were T-tips will become the number one option. All tips are equipped with ready-made loops. The Ace T-tip family includes three different length categories: 10ft, 12,5ft and 15ft. Each of the categories has three different weight classes: T10, T14 and T17. 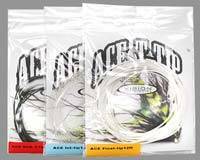 All tips come with pre-made loops on both ends to make your fishing nice and easy. Each tip has weight and length printed on one end for easy identification. 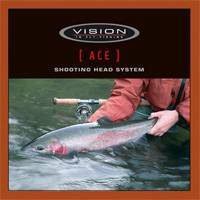 Vision ACE has become the highest selling shooting head system in the professional and competitive Scandinavian market. 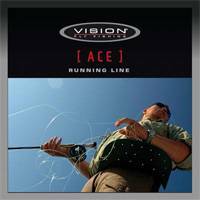 Vision's unique ACE fly line profile is easier to cast and has a very good turnover for presentation. The wide range of lines now come with ready made loops making it easy to choose and fit the correct one. Cutting and splicing is history... Step into the modern world of Ace of Spey. ACE shooting heads are now available with an interchangeable tip system. The package includes a floating head with floating, intermediate and sink 3 tips. The head and tips have strong and slim loops for easy and quick connecting and the head also has a loop at the back end for attaching it to the running line. 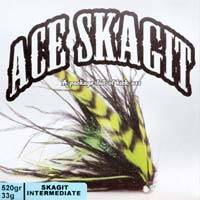 Ace tip lines perform very well with Skagit style casts too. The kit includes a mesh wallet for tips. A set of floating running lines to cover all your needs. These running lines don't have any memory whatsoever so there's no need to stretch them before use. 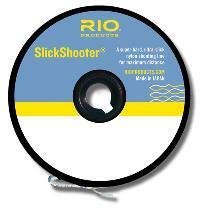 We have a readymade loop at one end for ease of attaching to your shooting head. A super hard, slick finish oval-shaped nylon shooting line, with no memory after being stretched and an extremely low coefficient of friction for long distance casts. 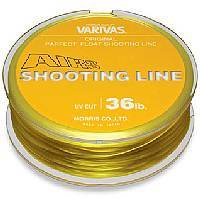 Size 35lb/15.9kg Orange 0.014" x 0.026"44lb/20.0kg Red 0.016" x 0.030"50lb/22.7kg Green 0.017" x 0.031"
The VARIVAS® Shooting Line is the result of years of experience combined with AIRS know-how to deliver the perfect product for specialist fly-fishers. Designed as a running line for shooting-head systems, the AIRS core gives it super floating properties and results in thin diameters and a very slick durable finish for achieving the ultimate distance.